UNRWA has evolved from a temporary relief and works program into a broad social welfare organization. This article surveys several historical issues regarding the involvement of the UN Relief and Works Agency for Palestine Refugees in the Near East (UNRWA) in the Arab- Israeli conflict. It is important to note that access to internal UNRWA documents remains very limited, making analysis of decision- making, policy and personnel particularly difficult. Further, the literature on UNRWA is not easily distinguished from that of the Palestine Arab refugee issue, which is vast, political and polemical. Almost since its inception, UNRWA, the international institution charged with aiding the refugees, has worked against their resettlement in Arab countries where Palestinians are located. One way UNRWA has done this has been by shifting its mission from refugee relief to education, devising its own expanded definitions of who is a refugee, and expanding its legal mandates to "protect" and represent refugees. As a result, the Palestinian clients of UNRWA have gradually taken over the organization and have undermined an international relief effort, created in naïve good faith, but with the complicity of the UN General Assembly. UNRWA has worked against refugee resettlement in Arab countries where Palestinians are located. Over the years, UNRWA, by its own admission, has proudly evolved from a temporary relief and works program into a broad social welfare organization for Palestinian society. It has also succeeded to such an extent that "there is little or no significant difference between the standard of living of refugees and non-refugees in the WBGS [West Bank and Gaza Strip], Jordan, or Syria." Maintaining those standards of living in dynamic economic conditions, much in the manner of a government, is a primary concern of the organization. Conversely, the international community, led by the United States and now, the European Union, has adopted a strategy of increasing support for UNRWA and other Palestinian institutions, such as the Palestinian Authority, in the traditional effort to avoid instability and, since the 1990s, in the attempt to shape Palestinian state-building. Another irony, however, is that UNRWA competes directly with the Palestinian Authority for international support. 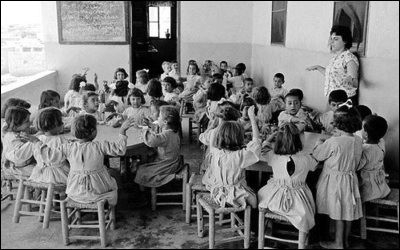 During the 1960s and 1970s, the PLO spread Palestinian nationalism through UNRWA schools. UNRWA's primary product—its educational infrastructure, most importantly textbooks used in UNRWA schools—are a product of the Arab countries, none of which have positive sentiments toward Israel or the peace process, while the teachers are Palestinians. During the 1960s and 1970s, one explicit goal of the Palestine Liberation Organization (PLO) was spreading Palestinian nationalism through the global Palestinian community, and in particular, through educational institutions to which it had access. In keeping with its nationalistic orientation and multilevel approach to Palestinian society at large, the PLO targeted schools, teachers' unions, and youth organizations. The same can be said for the PLO's rivals, the Muslim Brothers, which had been active in the West Bank since at least the 1960s. Between the two, Palestinian education was completely politicized. UNRWA and national governments also funded scholarships for Palestinians to pursue higher education in Western and Soviet bloc institutions. Indeed, UNRWA's defenders praise it as a Palestinian national institution and for providing many levels of Palestinian education. In 1974, the PLO adopted the "phased approach." This was a plan for the gradual destruction of Israel through the "right of return," meaning that Palestinians would be allowed to return to homes vacated during 1948 and thus create a demographic majority in Israel or a Palestinian "secular democratic state." UNRWA's turn to education during this period meshed well with the PLO's approach, as it did with the creation of the many UN resolutions to support the newly declared "inalienable rights" of the Palestinian people. Since the 1960s, UNRWA's actions, like those of the Palestinian Authority, have been criticized for their anti-Semitism and anti-peace content. Further, providing education for Palestine Arab refugees was also a critical means to generate Palestinian identity and nationalism, but then to transfer responsibility for its maintenance back to UNRWA and the international community. The influx of an increasing number of refugees from the West Bank into the UNRWA system following the 1967 Six-Day War appeared to offer an opportunity to conduct studies and establish a new baseline for the organization. Lack of host country cooperation and deteriorating political conditions in Lebanon, culminating in civil war, again made the process impossible. General rations from UNRWA were only eliminated in 1982, when the "Special Hardship Case" category was introduced. But financial crises continued throughout the 1970s and 1980s. From 1973 to the present, UNRWA has initiated a variety of emergency appeals, both in response to its own financial crises and to political or military events, such as the 1982 Lebanon War, the First Intifada of 1987, and the Gaza War of 2006. In fact, UNRWA has issued "emergency appeals" every year since 2000. No contributions by the United States shall be made to [UNRWA] except on the condition that [UNRWA] take[s] all possible measures to assure that no part of the United States contribution shall be used to furnish assistance to any refugee who is receiving military training as a member of the so-called Palestine Liberation Army or any other guerrilla type organization or who has engaged in any act of terrorism. UNRWA has come under persistent criticism for failing to adequately ensure that humanitarian supplies are not diverted to terrorist groups. Since the 1970s, a number of U.S. Congressional resolutions have sought to limit or cut off funding to UNRWA and the Palestinian Authority. American legislators regularly introduce language into appropriations bills to require UNRWA to advance transparency, self-policing and accountability with regard to vetting employees for terrorist connections as well as to eliminate the promotion of terrorism in educational materials. Similar provisions are regularly written into funding for United States Agency for International Development budgets, administered by the State Department, for grants intended for the Palestinian Authority. In 2002, a letter from U.S. Representative Tom Lantos, a ranking Democratic member of the House International Relations Committee, to United Nations Secretary General Kofi Annan, complained that "UNRWA officials have not only failed to prevent their camps from becoming centers of terrorist activity, but have also failed to report these developments to you." Annan replied to Lantos that "the United Nations has no responsibility for security matters in refugee camps, or indeed anywhere else in the occupied territory." Official U.S. Government analyses indicate that UNRWA has claimed to have responded by improving vetting of its employees against watch lists of Al Qaida and Taliban suspects, but that it remains unwilling to screen names against lists of Hamas, Hezbollah or other Palestinian groups provided by Israel. American legislators have identified another problem regarding UNRWA, namely that Congressional stipulations are regularly circumvented by a presidential waiver, in which the President finds that continuing aid to UNRWA and other Palestinian entities regardless of terrorist ties or structural concerns is in the national security interest of the United States. Congressional stipulations concerning UNRWA are regularly circumvented by a presidential waiver. These concerns have increased since the Hamas takeover of the Gaza Strip in 2007, where UNRWA remains fundamental to the local economy, and in subsequent years as the possibility has periodically resurfaced of Hamas reconciling with the U.S.-funded Palestinian Authority. As U.S. funding of various Palestinian institutions, including the Palestinian Authority itself, has escalated in recent decades, American lawmakers have repeatedly questioned members of the Executive Branch regarding diversion of funds to terrorism, or the presence of terrorists within U.S.-funded entities. Though the term "refugee warrior" has not been used, U.S. funding of this phenomenon is precisely the issue of concern to the U.S. Congress. It would be counter-productive if UNRWA did not receive sufficient funds to maintain the same level of assistance and services to the 3.2 million Palestine refugees that it had historically provided. The rationale for the support of UNRWA as an element of stability was more valid than ever and would remain so until a political solution to the refugee issue was found. The commencement of negotiations on the problem, as foreseen in the Declaration of Principles, would be likely to increase the level of anxiety and restlessness, as refugees followed the course of the discussions over their fate. At that stage, the continuation of UNRWA's traditional support for the refugee community and of Agency efforts to improve the living conditions of refugees would be indispensable as a social and political safety net. UNRWA's flaws have not gone unnoticed, even by members of the organization itself. Indeed, the most important critique to appear in recent years was that of James Lindsay, a former legal advisor and general counsel to the organization. Lindsay worked for UNRWA from 2000-2007 and, after leaving, produced a monograph in 2009 for the Washington Institute for Near East Policy that caused a firestorm. Lindsay concluded — to much controversy — that "the vast majority of UNRWA's registered refugees have already been 'resettled' (or, to use the UN euphemism, 'reintegrated')," and that the "only thing preventing citizens from ceasing to be 'refugees' is UNRWA's singular definition of what constitutes a refugee." Accordingly, Lindsay recommended that UNRWA responsibilities be handed over to Jordan. He acknowledged that legal restrictions on Palestinians being resettled in Syria and Lebanon were difficult, but not impossible to overcome, given time and effort. Some might question whether scarce international aid should be used to fund relatively sophisticated programs for Palestinians—not just education and health care, but also microfinance, urban planning, and so forth—rather than, say, food for starving Africans in places like Darfur. Even putting that question aside, why should such services be provided for free to those who can afford to contribute at least a portion of the cost? Finally, Lindsay suggested that the United States "urge UNRWA to limit its public pronouncements to humanitarian issues and leave political speeches to the political echelons of the United Nations." Lindsay's fairly modest suggestions for reform were not well-received by the organization and its supporters. A press release issued by Andrew Whitley, director of the UNRWA representative office at United Nations headquarters in New York, said: "The agency is disappointed by the findings of the study, found it to be tendentious and partial, and regrets in particular the narrow range of sources used." It added, "The study ignores the context in which UNRWA operates and the tight line the agency walks due to various pressures.... Someone reading this paper with no background would assume that the Israeli government was a benign actor. No mention is made of the occupation of the West Bank and the Gaza Strip." Responses from other UNRWA officials were equally harsh. Chris Gunness, UNRWA's spokesman in Jerusalem, said that Lindsay "makes selective use of source material and fails to paint a truthful portrait of UNRWA and its operations today." John Ging, head of UNRWA operations in Gaza, attempted to deflect Lindsay's criticism of negative depictions of Israel and Jews in UNRWA textbooks. In effect, he blamed the Palestinian Authority for the problem, saying Lindsay had "no basis to say that it is UNRWA's decision because our mandate is given to us. I agree that it is a political failure, but we don't set up the mandate, we are only the implementers." This echoed previous UNRWA responses to similar evidence as far back as the late 1960s. Attempts at forcing UNRWA reform have been undertaken piecemeal, rather than by tackling the overall problem. Critiques like Lindsay's have had some political effect, but attempts at forcing institutional reform have tended to be undertaken piecemeal, rather than by tackling the overall problem. Since the 1960s, for example, American lawmakers have tended to focus specifically on one of UNRWA's darkest legacies: its relationship with terrorism. Already in Section 301(c) of the 1961 Foreign Assistance Act (P.L. 87-195), as amended, Congress addressed this issue. This was certainly an important issue. Unfortunately, UNRWA's relationship with Palestinian terrorism has been a long one, particularly after the Palestine Liberation Organization (PLO) achieved both international political status and practical authority over the UNRWA refugee camps. Through agreements with the government of Lebanon in 1969 and its eventual UN status as a formal observer, the PLO gained a quasi-governmental role in local and international Palestinian affairs. Jalal al-Husseini, in his article "UNRWA and the Palestinian Nation-Building Process," wrote that the PLO soon began using UNRWA facilities as terrorist bases. UNRWA has taken very few steps to detect and eliminate terrorists from the ranks of its staff or its beneficiaries, and no steps at all to prevent members of terrorist organizations, such as Hamas, from joining its staff. These failings have occurred not because UNRWA consciously supports terrorism, but rather because it is not particularly concerned about the issue, its main focus being the provision of services and protection of Palestinian refugees. The American government has not ignored this issue. Since the 1970s, a number of Congressional resolutions have sought to limit or cut off funding to UNRWA, and Congress regularly introduces language into appropriations bills requiring UNRWA to promote transparency, self- policing, and accountability with regard to vetting employees for terrorist connections, as well as eliminating the promotion of terrorism in educational materials. Similar provisions are regularly written into United States Agency for International Development budgets—administered by the State Department—in regard to the Palestinian Authority. Moreover, after careful examination of UNRWA documents, Professor Benjamin Schiff, author of Refugees Unto the Third Generation: UN Aid to Palestinians, claimed that in 1965, UNRWA director Lawrence Michelmore offered Arab states a deal regarding refugee rolls and rectification. In exchange for new surveys, UNRWA would drop the criteria that Palestine Arab refugees had to have been resident in Palestine for at least two years before losing their residences and livelihoods, and that "other claimants," namely non-refugees, Bedouin, and poverty stricken individuals, would be added. In this way, a "third generation" of Palestine Arab refugees would have been added to the rolls. All of these concerns have increased since the Hamas takeover of the Gaza Strip in 2007, where UNRWA remains fundamental to the local economy, and in subsequent years, as the possibility has periodically resurfaced of Hamas reconciling with the U.S. funded Palestinian Authority. As U.S. funding of various Palestinian institutions, including the Palestinian Authority itself, has escalated in recent decades, American lawmakers have repeatedly questioned members of the Executive Branch regarding diversions of funds to terrorism, or the presence of terrorists within U.S. funded entities. Though the term "refugee warrior" has not been used, U.S. funding of this phenomenon is precisely the issue of concern to the U.S. Congress. UNRWA's ever expanding role in the Palestinian economy is measured through the number of its local employees. By the mid-1970s, UNRWA had 15,000 employees. During the 1980s and 1990s, refugee participation in UNRWA increased still further into "planning, implementation, monitoring, and evaluation of Agency programmes." UNRWA now has more than 30,000 employees, the largest of any United Nations organization, and only a small number of international employees. It maintains two headquarters offices in Gaza and Amman, five field offices in Gaza, Lebanon, Syria, Jordan and the West Bank, and four Representative offices, in New York, Geneva, Brussels, and Cairo. There are some 3,000 employees in Lebanon and 10,000 in Gaza. The "approved total budget" for 2011 was $624.7 million, with most funds coming from the United States and the European Union. The assumption of moral hazard by the United States alone through contributions to UNRWA has amounted to some $4 billion since 1950. This process of a complete and total Palestinian takeover of UNRWA is similar to regulatory capture, which occurs when a state regulatory authority is taken over by the interests or industries that it is designed to control. UNRWA is an international agency that is effectively managed by the interests that it is intended to serve. The full weight of the organization's coercive "soft power" and halo effect have been brought to bear on local and international political and media processes in order to shield it and keep the rent-seeking cycle in operation. This has been done in large part by members of the "refugee" population itself working within UNRWA, with the help of the senior international managerial staff. By acting as a pressure group, the organization has thus been able to extend its mandate, and ward off oversight and reform. It might also be asked whether UNRWA's prerogatives and operations constitute a deliberate infringement on the sovereignty and legitimacy of the Palestinian Authority. Finally, in the fall of 1949, when the Clapp Commission visited a refugee camp and was met by protest, an American Friends Service Committee (AFSC) staffer reported that "A large sign had been printed in English on which were the following, numbered as indicated: 1. Send us back home. 2. Compensate us. 3. Maintain us until we are refreshed. Just what they had in mind by 'refreshed' I leave to your imagination." This embodies UNRWA's mandate today. Asaf Romirowsky is an adjunct fellow at the Middle East Forum and co-author of the book Religion, Politics, and the Origins of Palestine Refugee Relief. Mario Babille, Ian Barney, Rex Brynen, Lauri Blome Jacobsen, Lena Endresen, Gro Hasselknippe, UNRWA's Financial Crisis and Refugee Living Conditions 166 (2003), available at http://almashriq.hiof.no/general/300/320/327/fafo/reports/427-vol1.pdf (last visited March 18, 2015). E.g., UNRWA, Labour Market Briefing, West Bank, Second Half 2010, available at http://www.unrwa.org/userfiles/201106082849.pdf (last visited October 23, 2014). The press release announcing this report pointed to the loss of 3% in the real value of wages for refugees and non-refugees in the West Bank and warned that this "regression" in economic conditions "is likely to raise the rate of aid dependency among refugees, placing ever greater pressures on UNRWA." "New UN research challenges conventional view of the West Bank economy," United Nations Relief and Works Agency (June 8, 2011), available at http://www.unrwa.org/etemplate.php?id=999 (last visited October 23, 2014). In 2010, Canada redirected its contribution of approximately $10 million (Canadian) away from UNRWA and towards "specific projects in the Palestinian Authority that will ensure accountability and foster democracy in the PA." Reports indicate that Canadian funding would be directed towards building the PA's justice system and courts. See, Canada elects to fund PA justice system, JERUSALEM POST, January 13, 2010. Canada's contribution comprised approximately 1% of UNRWA's normal operating budget. Reports indicated in 2011 that Holland was also considering defunding UNRWA. Han ten Broeke, member of the Dutch Parliament, VVD party speaker, stated: "UNRWA uses its own unique definition of refugees, different to the UN's. The refugee issue is a big obstacle for peace. We therefore ask that the government acknowledge this discrepancy, which leads to the third-generation Palestinian refugees." Tzvi Ben Gedalyahu, "Holland May Cut Funds to UNRWA," Arutz Sheva (Dec. 13, 2011), available at http://www.israelnationalnews.com/News/News.aspx/150674 - .Tuo-GiOXQy8 (last visited October 23, 2014). Emanuel Marx and Nitza Nachmias, "Dilemmas of Prolonged Humanitarian Aid Operations: The Case of UNRWA (UN Relief and Work Agency for the Palestinian Refugees)," Journal of Humanitarian Assistance (July 15, 2004). 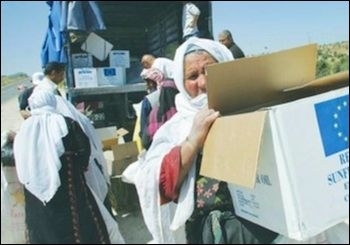 2012 UNRWA Emergency Appeal, requests US $300,724,896 and warns of growing "settler violence," house demolitions and a "vicious cycle of unemployment, food insecurity and aid dependency," available at http://www.unrwa.org/userfiles/2011120681236.pdf (last visited October 23, 2014). U.S. Gov't Accountability Office, GAO-09-622, "Measures to Prevent Inadvertent Payments to Terrorists Under Palestinian Aid Programs Have Been Strengthened, but Some Weakness Remain" (May 2009), available at http://www.gao.gov/new.items/d09622.pdf (last visited Nov. 6, 2014). Isabel Kershner, "The Refugees' Choice," The Jerusalem Report, August 12, 2002. See Jim Zanotti, Cong. Research Serv., RS22967, U.S. Foreign Aid to the Palestinians (August 29, 2011), 17-18; supra note 6. Zanotti, supra note 8, at 7, 11-12; Alexander Joffe, "Who Oversees Foreign Aid to the Palestinians?" The Gatestone Institute (2011), available at http://www.gatestoneinstitute.org/2085/palestinians-foreign-aid (last visited October 23, 2014). J. Zanotti et al., Cong. Research ServRS40101, Israel and Hamas: Conflict in Gaza (2008-2009) 16 (2009), 36-37.
 . E.g., Committee of Foreign Affairs, H.R., Connecting the Money to the Mission: The Past, Present, and Future of U.S. Assistance to the Palestinians. Hearing before the Subcommittee on the Middle East and South Asia, December 12, 2007. Report of the Commissioner-General of the United Nations Relief and Works Agency for Palestine Refugees in the Near East, July 1, 1994-June 30, 1995, para. 56. U.N. Doc. A/50/13 (SUPP) (1995). James G. Lindsay, "Fixing UNRWA: Repairing the UN's Troubled System of Aid to Palestinian Refugees," Policy Focus 91 (2009), available at http://www.washingtoninstitute.org/uploads/Documents/pubs/PolicyFocus91.pdf (last visited November 2, 2014). Natasha Mozgovaya, "Ex-UNRWA official blasts agency for politicizing Palestinian refugee issue," Haaretz, February 8, 2009. Jalal al-Husseini, "UNRWA and the Palestinian Nation-Building Process," Journal of Palestine Studies (2000), 51-64. Lindsay, supra note 13, at 32. Benjamin N. Schiff, Refugees unto the Third Generation (1995), 53-54. Supra note 10, at 16, 36-37. E.g., Committee on Foreign Affairs, H. R., 110th Cong. Connecting the Money to the Mission: The Past, Present, and Future of U.S. Assistance to the Palestinians: Hearing before the Subcommittee on the Middle East and South Asia, of the 110th Cong. (2007). Available at http://www.gpo.gov/fdsys/pkg/CHRG-110hhrg39670/content-detail.html. Terry Rempel, "UNRWA and the Palestine Refugees: A Genealogy of 'Participatory' Development," Refugee Survey Quarterly 28:2-3, p. 425 (2009). 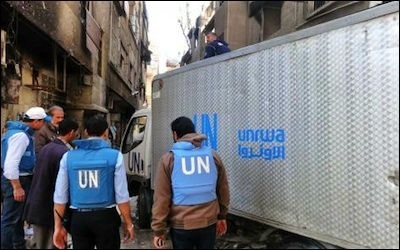 Working at UNRWA, http://www.unrwa.org/careers/working-unrwa (last visited October 23, 2014). Core Programme Budget, http://www.unrwa.org/how-you-can-help/how-we-spend-funds/core-programme-budget (last visited October 23, 2014). Zanotti, supra note 8, at 2. Don Stevenson to Bronson P. Clark, "Interview with Ambassador Eliahu Elath of Israel at the Israeli Embassy, Washington on August 9, 1949," American Friends Service Committee Archives, August 12, 1949.